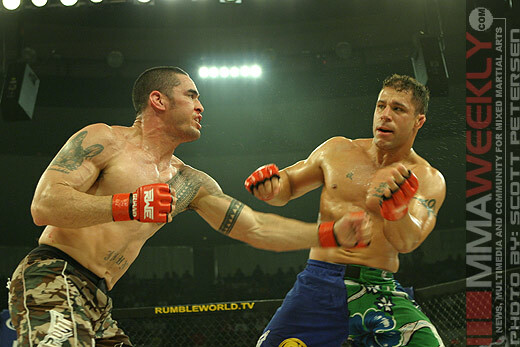 HONOLULU, HAWAII – Rumble On The Rock 8 took place last night in Honolulu, Hawaii at the Blaisdell Arena featuring the first round of their 8-man Welterweight Grand Prix. 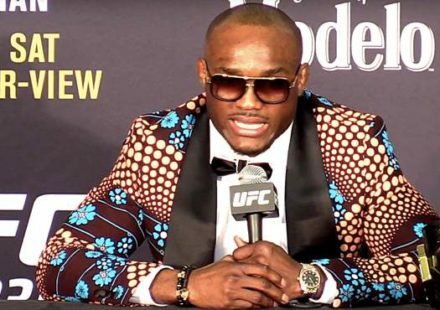 There were some upsets, some strange twists in the finishes, and one hard-headed fighter that didn’t want to let the fans down. In an MMA fight under special rules, ground fighting was limited to 15-seconds per instance regardless of the situation, Eric “Butterbean” Esch and Wesley “Cabbage” Correira made for a pretty exciting fight with an interesting twist when all was said and done. 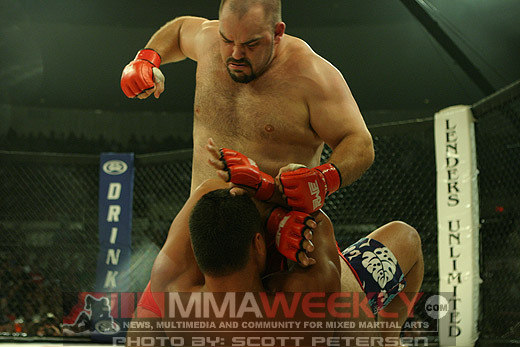 Butterbean scored early with some huge hands that rocked Cabbage, but the dwarfed 260-pound Hawaiian fighter locked up and took the much bigger Butterbean to the ground and pounded on him for the duration of his 15-second limit. Cabbage probably would have ended the fight right here had there been no limit to the ground fighting, but with the special rules, the fight was restarted on the feet and the fireworks continued. Cabbage looked to edge ahead with some good infighting and Thai elbows. 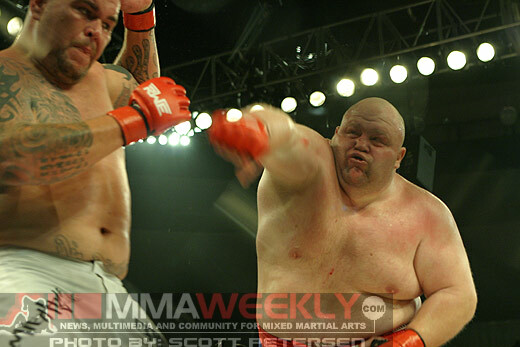 The second round saw Butterbean come out strong, rocking Cabbage with more of his patented pounding. Cabbage continued to work for the Thai clinch and elbow strikes, but nearing the end of the round he appeared to be injured. Most of us ringside thought that Cabbage had suffered some sort of rib injury. He continued on to finish the round, but couldn’t answer the bell for the third, giving up the TKO to Butterbean. The official result indicated that Cabbage had actually suffered a broken arm, not a rib injury. 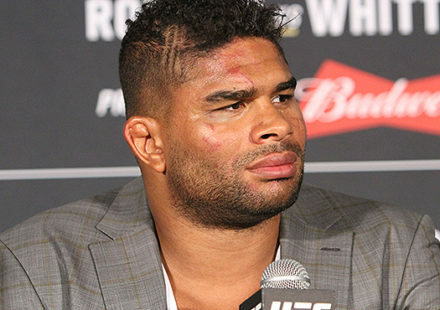 Following the show, Alan Goes confirmed that the fight was stopped due to the fractured arm, but also said that the injury did not occur during the fight. According to Goes, Cabbage was warming up backstage and slipped in a puddle of water and ended up being injured in the fall. The doctor in attendance checked the arm and believing it was broken, told Cabbage not to fight. 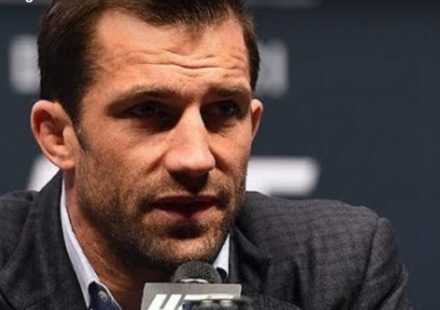 Not wanting to disappoint the fans and call off the main event, Cabbage made the decision to continue with the fight, eventually having to give up his quest following the second round. In one of the more highly anticipated bouts on the card, Frank Trigg was good to his word as he stood and traded blows for much of the fight with Hawaiian favorite Ron Jhun. Trigg landed a few good inside leg kicks that set up some scoring combinations, but didn’t appear to be able to hurt Jhun very seriously throughout most of the bout. Jhun also landed some good blows himself and even appeared to have stunned Trigg at one point, but he wasn’t able to do anything to put the fight away either. Trigg capped the fight, which he appeared to score the edge in with some solid takedowns, with a dominating third round performance. He landed two big takedowns in the round and was a little more aggressive with his ground attack, solidifying the decision. Overall, this was a fairly close fight and it was a little surprising that two of the judges scored all three rounds in Trigg’s favor. Despite the loss, his third straight, Jhun showed a lot of heart in his performance and proved that he can still hang with the top fighters in the world. With the win, Trigg moves on in the tournament to face the surprising young underdog Carlos Condit. Most people went into this tournament feeling that Charuto Verissimo was being “fed” a tomato can in little-known New Mexico fighter Carlos Condit. Making a splash on the regional scene in the Rocky Mountain area, Condit showed the explosiveness that earned him a berth into this tournament and proved the doubters wrong. In just 17 seconds, he dispatched Verissimo and continued his streak of never having an MMA fight go to a decision. When the bell sounded, Charuto came across the ring and threw a couple of punches and immediately dropped down to shoot in on Condit. 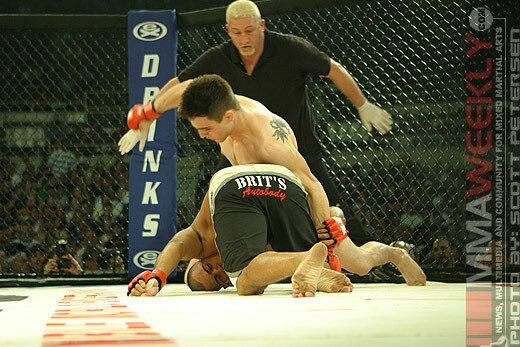 As he did so, Condit caught Verissimo upside the head with a knee that sent the BJJ specialist to the canvas. Condit quickly pounced; landing a few punches followed by about 3 to 4 more knees to the head before the fight was stopped. Verissimo was taken to the hospital for stitches in his lip and for a routine check to make sure he was okay following the TKO. A real wildcard in this tournament, the lanky Condit is the dark horse in this tournament and has a build and style that could be trouble for the other fighters that are moving on to the next round. That coupled with the confidence of youth, he has a legitimate shot to contend for the title. In a fight that didn’t have the pop that many felt it would going in, Jake Shields and Dave Menne fought their way through three rounds with neither fighter coming very close to finishing. Menne, having a difficult time cutting down to the 175-pound weight limit, looked every one of his 31 years. He was on the defensive throughout most of the bout and appeared sluggish, most likely due to the difficulty in cutting weight. 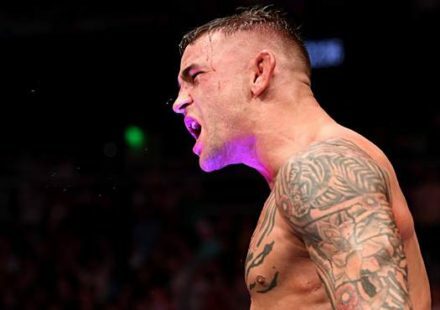 Shields was constantly attacking and was able to keep Menne on his back for the majority of the bout, but was never really able to come very close to putting away the veteran fighter. Of course with Menne’s experience, he’s pretty good at foiling just about anyone’s attack and making them look bad. In the end, Shields did enough to earn a unanimous 30-27 score on every judge’s scorecard and move on to face Yushin Okami in the next round. Anderson Silva dominated this fight from beginning to end, including the finish. Unfortunately for him, the finish was illegal. Silva hammered Okami with leg kicks throughout the round and stuffed all of his takedown attempts until about two minutes into the round. Following his only successful takedown, Okami was on his knees working a ground and pound attack when Silva reached up with his leg and clocked Okami across the jaw with his heel, knocking out the Japanese fighter. The fight was stopped, but there was some confusion as officials sorted out the situation. When all was said and done, Silva’s brilliant kick across the jaw was deemed an illegal technique since Okami had both knees on the ground. 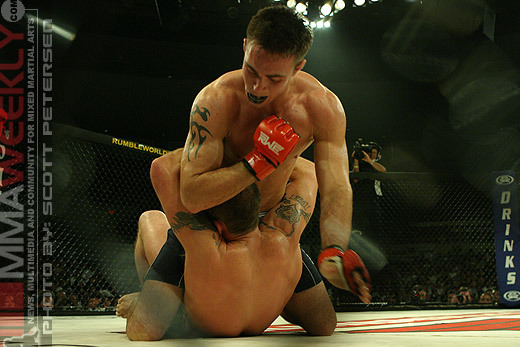 Thus, despite being knocked out, Okami was ruled the winner by disqualification and moves on to the second round of the tournament to face Jake Shields. Highly regarded as one of the favorites to win this entire tournament coming in, Silva found himself in a disappointing situation; which leaves him on the outside looking in. Vilatonu Vonokalaifia got off to a good start taking Scott Junk down from the clinch and landing in a full mount position. 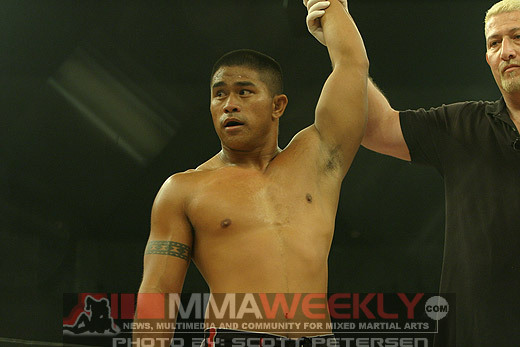 He slowly started to mount up some solid blows, but as Junk tried to work his way out of danger, Vonokalaifia went for a guillotine choke, which allowed Junk to reverse position and attain the mount. Unlike Vonokalaifia, Junk was able to rain down blow after damaging blow causing the TKO stoppage as Vonokalaifia made a vane attempt to cover up. Originally slated to fight Ultimate Fighter Season 2 veteran Jason Von Flue, Ross Ebenez instead was faced with last minute substitution Josh Donahue, a fighter from the Rage In The Cage promotion in Arizona. Being outweighed by 13 pounds, Donahue made a game attempt, continually shooting on Ebanez, but the bigger Hawaiian made it look easy. He took his time landing a solid shot here and there before dropping Donahue. From his back Donahue attempted to snag an arm bar, but Ebanez picked him up and tossed him off like a rag doll before pounding him into a TKO stoppage by referee Larry Landless. In the first bout of the night, Kengo Ura, training out of R1 in California and Enson Inoue’s Pure Bred in Japan, took out local Hawaiian favorite Mike Malone in the first round. 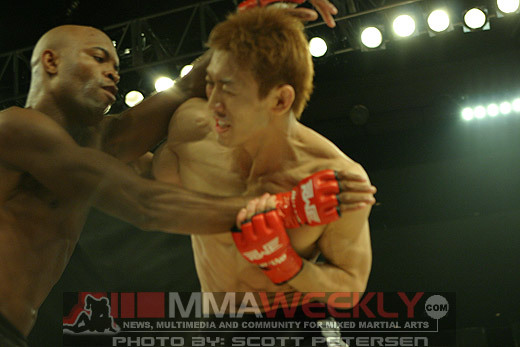 After a short feeling out period, Ura nearly locked on a Kimura, but Malone managed to escape. Ura stunned Malone by dropping down from a standing position in the guard, stood back up, and then faking another big drop, slipped back into an ankle lock that immediately had the Hawaiian tapping out.